28 Days to Better Energy, Less Stress and Taking Back Control of Your Eating! Registration will be opening again soon! In the meantime, sign up to my waiting list to be the first to hear about the next course dates. Everyone knows that new Mums are often shattered. But no one tells you that feeling tired can go on for years and years... without ever feeling like you’ve got your old self back. If you feel constantly tired, unable to manage stress, out of control with your eating, addicted to sugar and generally feeling under par most days, then this online programme is for you. Trust me... 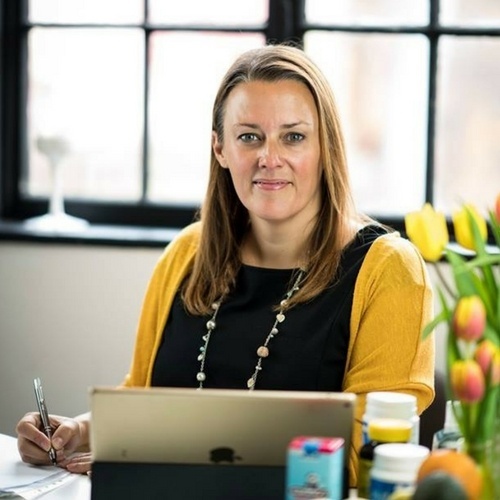 I was once a Shattered Mum too, and I've put together an incredible programme of dietary changes (that are easy to follow and simple to incorporate into your family life), lifestyle tweaks and nutritional changes that can make a difference, really quickly. I'll show you how you can eat well every day… even if you have no cooking skills, are a self-confessed sugar addict, find meal times stressful and life is so busy that you can’t even imagine fitting in food preparation. "I cannot recommend this course enough!" “It has been amazing. It was so much more than a nutritional course... but so much more about living a long, healthy and happy life. It really felt that you were like a ‘life coach’ who knows so much more than nutrition, it was the whole package, a complete holistic approach to living life well. - Jo, Norfolk. Shattered Mum Recovery Programme, July 2018. ...and I’ve taught these strategies to so many women in my private clinic, with immediate results, and most recently to my first online group of Shattered Mums. I want to share this effective and life-changing programme with as many Mums as I can. I want to coach you through a programme that can help you change this forever... in a way that doesn’t involve any faddy diets and will help you improve your relationship with your food and your body… for good. Ready to claim back your energy and vitality? “I feel a million times better. I have more energy, less anxiety and my peri-menopause symptoms have all but disappeared…. Thank you so much for your help. When will the lessons take place and what if I can't make it? The meetings will be via Zoom - a really easy to use meeting software that's free to use - I'll send you the link a couple of days before our first meeting so you can get yourself signed up. You'll also be sent recordings of all the lessons to catch up and watch again. What if I have a medical issue, take medication or have food intolerances. Can I still join? Yes you can - just ask me about anything you’re unsure of. Also you should consult with your GP about any pre-existing medical conditions or medications you take, before starting on any nutritional supplements which may be recommended as part of the course, and whether changing your diet is suitable for you. Will there be supplements to buy? Diet and lifestyle changes always come first... but supplements can help speed up your journey, so I'll be making some supplement recommendations if you wish to purchase them. But this isn't essential. You'll also get 15% lifetime discount on any supplements you purchase... so you can continue to use them after the course has finished at the discounted price. Will I get a course pack or notes? Yes in week 1, I'll be giving you access to your first course pack right here on Thinkific. This will exlain all the basics of how you're going to eat over the 4 weeks, some "homework" sheets to fill in so that you can show me the dietary changes you've made, health goals you've set yourself and daily motivation tasks. Then as the weeks go on, I'll be releasing more meal ideas, recipes, tips, meditation videos... and anything I think you need to keep you on track and motivated. You’ll also be able to access all the course material via my online learning portal, so you’ll find everything you need in one place. "This course has been so healing for me… my energy levels have significantly increased and evened out, and I’m finally free from the desperate urge for a midday nap! I’m rarely hungry, and get an enormous buzz out of knowing everything that I put into my body is fuel for my busy life, as the parent of a high-energy toddler.